Common to many parts of the world is the pedestrian crossing with a red or green man, usually with a static stick figure. In Santiago, I chanced upon this unusual crossing, where the red man stands still, but the green man starts to run, and runs faster and faster as the time left for crossing the road runs out. I also discovered the weekend haunt for what must have been most of Santiago's runners and cyclists. Taking the funicular railway (1,000 Chilean Pesos) to the top of San Cristobal hill saved 300 metres of climbing, on an unseasonally hot May morning. The hill is part of the Metropolitan Park and the top was crowded with cyclists and runners. There are a few marked tarmac routes around the park, with very little vehicle traffic. With breathtaking views to distant Andean peaks, and a hazy view of the entire city of Santiago, it provides a wonderful area to explore on foot. 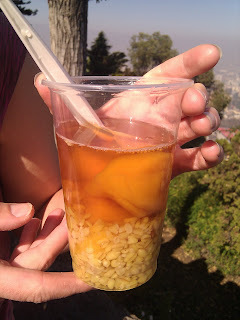 The locals were queuing up to buy an intriguing drink, consisting of dried peaches and cracked wheat, in a syrupy juice. Known as mote con huesillo, and full of energy, I can see why the cyclists and runners were are refuelling on it after reaching the hilltop. The park extends away from the summit for several miles and includes a zoo and formal gardens. The open air swimming pools were unfortunately closed - a quick dip would have been most refreshing after the long, sunny walk.